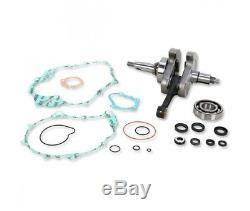 Engine kit that includes crankshaft, high-end bearings, main bearings and lower end, which includes all necessary gaskets. Crankshaft assembled in factory, rectified to OEM specifications. Surface treatment resistant to corrosion. Top and bottom case cemented at 58-62 rc to optimize the bearing surface running. Crank bearing bearing radial play is optimized to ensure maximum performance. Wiseco seals complete kits made from quality materials for maximum waterproofness. All bearings are oem quality for reliability and performance. Connecting rod kits come complete with rod, crankpin, crankpin bearing, premium bearing and thrust washers. Possible to do a group send for several pieces to decrease the port for that go on. Agpl is more than 300 000 orders shipped .. road bikes, scooter, all terrain, cross, quads. Open since January 2004, agpl motorcycle parts is a recognized specialist in motorcycle recovery and in the sale of spare parts new or used adaptable. Monday 13h30-18h Tuesday to Friday 9h30-12h30 // 13h30-18h Saturday 9-12h (no such). Our products are shipped within 3 days with tracking number (a higher time will be specified on the product sheet) we accept returns. You have a period of 14 days from the date of receipt of your purchase to return your package. (see our conditions of sale). All our products are new and authentic, or used from damaged motorcycles and controlled in good working order. We are a registered company. The item "yamaha 660 raptor-01/05-kit engine wiseco-0921-0144" is on sale since Monday, September 24, 2018. It is in the category "auto, motorcycle parts, accessories \ motorcycle \ spare parts \ engines , engine parts \ crankshafts, connecting rods ". The seller is "motosagpl" and is located at / in chavanoz - 38230.